Installed a new power distribution system built by Hinton Instruments. Busbar is the ideal way to distribute power across large modular systems. This one was built to power a 35-unit MOTM system. The power supply rack mounts on the rear of the case. The busbars screw onto the rear wall vertically (this system has four bars +15V, -15V, 0V, and a +5V bar for the special MOTM-650 and 730 units). Power moves from the wall, to the power supply, to the busbars, and then to each individual module. The new power system solved a problem I was having with envelope voltage bleeding into oscillator pitch, and some other weird stuff. Now everything is isolated and working perfectly. A stable modular system starts with well-designed power distribution, I should have done this from the beginning. Also, Graham Hinton is a modular power supply wizard. 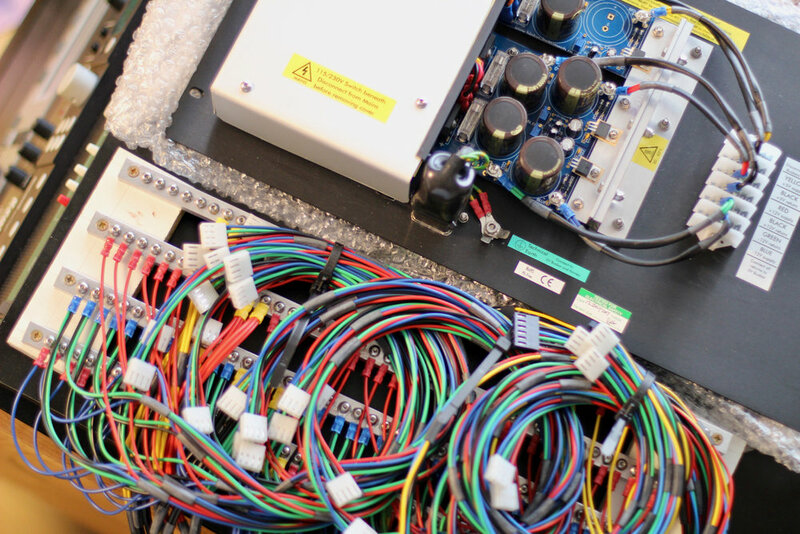 He figures out what you need, measures every cable to be just as long as it needs to be to reach it's module, and attaches all the cables to the busbars...so it arrives ready to instal! I took out my cabinet's wood rails and installed heavy-duty standard 19" studio rack rails. Penn Elcom makes some nice ones; you can order any odd length you need, and they are marked in one-unit increments. For this project I needed six 17U rails. For installation I used L-brackets (30H x 80L x 20W mm). The rails already have mounting holes, so you just need to drill holes at matching locations on the brackets (mine already had holes in approximately the right places, I ended up with an oval hole after drilling it out some more). Then just secure the bracket to the rail using rack screws/nuts. In order to put two rails right up against each other with no gap, I had to space the bracket-holes differently for top/bottom rails, so the heads of the fastening screws didn't touch each other. 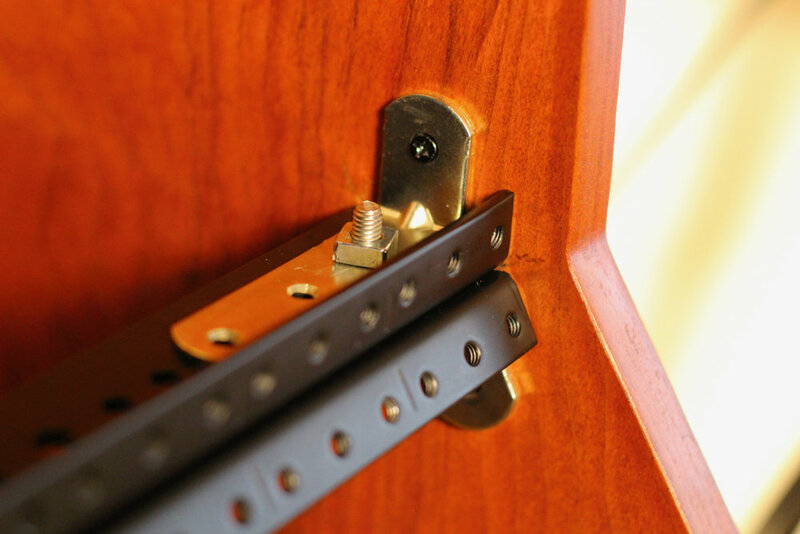 If you do this project perform a lot measurements beforehand to make sure the modules you are going to install on the ends of each row aren't going to have any pieces behind their panel that touch your L-bracket or fastening screws. Also make sure you don't have any clearance issues where the metal beyond the rail's holes touches your module's pots. 1) Rack Screw, 2) Penn Elcom with washer, 3) Penn Elcom without washer, 4) MOTM screw. MOTM was designed with professional studio standards in mind. That's great, but along with studio rack rails come chunky 10-32 rack screws to mount your modules (instead of the smaller screws people use with the lighter MOTM 19a rails). The solution I found is to use Penn Elcom M6 High-Point Rack Screws. These are the same diameter as standard rack screws in total, but have a detachable washer that makes up much of the diameter...toss that and find lower profile washer (I think 9.5mm outer and 4.3mm hole would work, but I haven't got mine yet, will confirm later). Also, the Lamond Design cherry case needed a polish. Secret formula? Just shake 2/3 parts olive oil + 1/3 part white wine vinegar, rub in, wipe off. Easy and cheap. For scratches I used a 10% iodine solution; paint it on with a small modeling brush, and wipe off after around 10 seconds...keep doing that until the scratch is the same color as the wood. What's MOTM? An engineering genius by the name of Paul Schreiber designed the MOTM Analog Modular Synthesizer system in 1998 (early on in the second-coming of modular). It's utilitarian, not fancy-looking, reasonably priced...and maybe the best synth in the world. Built for pro-studio use, reliable, constructed like a tank, and just all-around fantastic sounding. I already had 10 modules, and added another 25 to completely fill the cabinet. Previously I had mixed and matched modular systems in the same cabinet (just asking for problems), but with this remodel I decided to stop the madness and just make it a dedicated MOTM system. All built, and modified, by Frogleg Synthesis. The system uses two MOTM-650 MIDI-CV converters; one receives data from the keyboard to output a melody, and the other receives data from the sequencer to output 4 other instruments. There is also a MOTM-730 pulse divider slaved to the sequencer's MOTM-650 click output. These three units aligned on the left side of the case are the controlling modules. From there signals flow rightward to oscillators, filters, envelopes, and out 6 voltage-controlled amplifiers on the right side of the cabinet, to the speakers and tape. All the MOTM-300 and MOTM-310 oscillators got a Fine Tune Mod. For whatever reason the "fine" tune on MOTM systems covers a full octave. I had my units modified so the knob covers around 50 cents. That let's you easily fine tune to the pitch, and then dial in common +/-1-10 cent detunings. And with me, I tune to 1/10 cent using a digital strobe, so this smaller knob-range makes that easy (previously, even breathing on the knob moved it like 5 cents!). The MOTM-800 Envelopes got a LED Mod which adds a Tellun LED circuit. This gives you 4-stage ADSR visual feedback (a bright flash for the attack/decay, decreases to sustain level, and then fades out with the release). Very informative, plus it adds some much needed "bling" to the utilitarian MOTM style. Also, mine were built to give off some serious flash, not a tame LED. The MOTM-800s also got an Attack & Decay Mod. When I measured the attack times, I found that knob settings 0-3 covers 0.5-100 milliseconds, and the longest setting of 10 is around 4 seconds. But for normal use (not slow ambient music) common attack times would be 1, 3, 10, and 30ms. I found it was not only hard, but impossible, to dial in some of these settings. The reason is that there are jumps when turning the knob; at 0 the attack is a clicky 0.5ms and it stays that way until 2 where it jumps to 10ms, and then by 3 it is 100ms. The mod Pete at Frogleg Synthesis is working on would give more resolution and smoothness in the 0-5 knob positions for dialing in common 1-50ms attack times (and the same thing for the decay times). And then I'm leaving half of my 800s unmodified for slow stuff. I'll post back once we get it figured out. All modifications by Frogleg Synthesis. The keyboard was updated to a Native Instruments Komplete Kontrol S49, which I can verify communicates excellently with the MOTM-650 MIDI-CV converter. The keyboard sends note, gate, pitch wheel, and mod wheel information to the modular (you can also map the knobs on the keyboard to AUX 1-4 of the MOTM-650, although I don't see any point in doing this since you can just tweak the knob on the synth). It has an advanced cord and arpeggio section which will be useful. It uses touch wheels, I'd prefer good old-fashioned mechanical wheels, but these work great and I think I'll be able to adapt my playing. My only complaint; why are these midi keyboards so friggin' large!? There is a lot of bulk that could be cut out of this unit. For modulation control, in addition to the mod wheel on the keyboard, I'm also using a Moog EP-3 Expression Pedal into a MOTM-850 Pedal Interface. The mod wheel CV and pedal CV both go into a MOTM-190 dual VCA, which can then be routed out to whatever modulation destination. I finally sold my MPC-3000 and am using a Native Instruments Maschine Studio as the sequencer now. I have a library of sounds from rhythm machines I've sampled over the years, and this unit can trigger those individual samples, or play back entire rhythm loops with the ability to adjust the tempo (it splices the loop into hits and then adjusts their spacing). It's also good for creating arpeggiation sequences. Maschine has three MIDI outputs: output 1 goes to the modular synth, and outputs 2-3 send MIDI cc data to the Moogerfooger effects rack. This lets you control the parameters of the MF-104 Delay and MF-108 Cluster Flux Chorus (especially tempo tempo sync). So the sequencer is outputting 1) rhythm machine samples, 2) MIDI to the modular synth to be converted into CV, and 3) two channels of MIDI cc to the effects rack. All the instruments and effects that get recorded are still analog, but there is now a digital front-end triggering them. When doing multitrack recording Maschine syncs nicely to Nuendo (DAW). You just create a channel in the DAW, and insert Maschine as an instrument. At that point Maschine is slaved solidly to Nuendo's master clock. Anywhere you jump to in your DAW project, Maschine goes to that spot in its sequence. Basically I just use Maschine as a "plug-in beat maschine", referencing rhythm samples on my hard-drive...and overdub modular synth on top. And as the project progresses you can do a digital bounce to print the rhythm to 16 audio tracks. Also, Machine helps for doing tempo-synced overdubs. If you plug in the Maschine hardware controller, then you can send midi from Maschine running in Nuendo, to the Maschine controller, and out its MIDI port to the modular synth (MOTM-650)—good for overdubbing tempo-synced stuff like arpeggios or echoes. Sync can be a nightmare so it's great to have a solid chain of command: Nuendo is the clock boss, sending orders to the Maschine hardware controller, which in turn sends orders to the modular synth and moog effects. Bringing it all together—I made a thick wood platform that gets "sandwiched" between the modular cabinet and a Z-stand. Four screws secure the platform to the base of the cabinet so it doesn't slide around. The keyboard floats on this platform, and with the heavy modular and thick platform, it's all very stable. Screwed onto each side of the platform are metal hooks to conveniently hold patch cables. An industrial power strip is screwed to the underside of the platform, with holes drilled so the keyboard/sequencer power cables pass thru to the strip below. When you sit down at the modular you just hit the button under the keyboard and the whole station powers on—modular, keyboard, sequencer and monitors! The modular station is all set up in my new studio in Seoul, ready to record! Going to film a new set of live patches, and then try to get an EP released late this year. Also doing a modular expansion. Switching to a busbar power system for cleaner power and better tuning stability, adding 25 new MOTM modules to the main cabinet, and building a "header" cabinet to house the row of MacBeth MK-1 modules. It's growing! Here is the process for customizing the MOTM-650's tuning table with your own tunings (using a mac). If you found this page that was the hard part, the process is actually quite easy. The MOTM-650 uses Midi Tuning Standard (MTS), which was designed by Robert Rich back in the early 90s. You just need a simple program to write MTS files, and transfer them into the 650. Download Max Magic Microtuner (MMMT), and get a license. Connect a Midi In/Out interface to your mac (something simple like the M-Audio Uno will work), and connect the in/out cables to the MOTM-650. Open MMMT, and select your Midi interface on the Midi Settings Palette, from the drop down list. Now create a custom tuning using the MMMT program (you might need to read the instructions). Alternately, if you are like me and find MMMT excessive, you can import a standard Scala (.scl) tuning file into MMMT. Just click the "Import SCL" button. Make sure the "Expand at Load" box is checked so that your scale expands to cover all octaves. If you don't know, a scala file is a very simple text file, it's just a list of pitch ratios, or cents. Finally, send the tuning from MMMT to the MOTM-650. From the Midi Settings Palette click "Send tuning via SysEx". A box will come up with a few options. Leave everything alone except 1) select the tuning program number you want to overwrite [you can't overwrite #0 equal temperament, so start your tunings at #1], and 2) type in an eight character name. Click send. Your new tuning should now be in the MOTM-650! Well, the new modular synth is up and running! Why modular? If you're into the primordial thing that is sound itself, not a specific instrument, it's the ideal sound-shaping tool for studio work. You can craft nearly any imaginable sound using a modular; strings, bells, percussion, cymbals, ocean waves, a dying cat, as well as otherworldly abstract sounds. The audio quality, and all the available outputs, make it a serious tool in the studio. The system uses MU modules (which stands for "Moog Unit"), the original large format of the 70s. The system is equally split between MOTM and MacBeth modules. MOTM modules have a clean "modern" tone, big as a house sound, and highly musical. MacBeth has a slightly more "retro" tone. Both are among the best sounding synths available, very hi-fi to my ears. The modules are controlled by a central unit -- the MOTM-650 (one of those rare "vintage digital" pieces that is long out of production but simply can't be beat). This unit takes notes played on the keyboard and converts them into controlled voltage, which is sent out to the modules. What makes it special is that it outputs pure intonation with deadly accuracy (1.00 volt = root note, 1.25v = a major third, 1.50v = a perfect fifth, 2.00v = octave, etc, all user programable). And it's polyphonic, controlling up to four oscillators gracefully. Rhythmic patches are controlled by a MOTM-730 (also discontinued, but Paul Schreiber built me one). Finally, for monitors I wired up a pair of Focal CMS-50. These little guys have fantastic thick midrange, which is where you want the focus for synth recording.